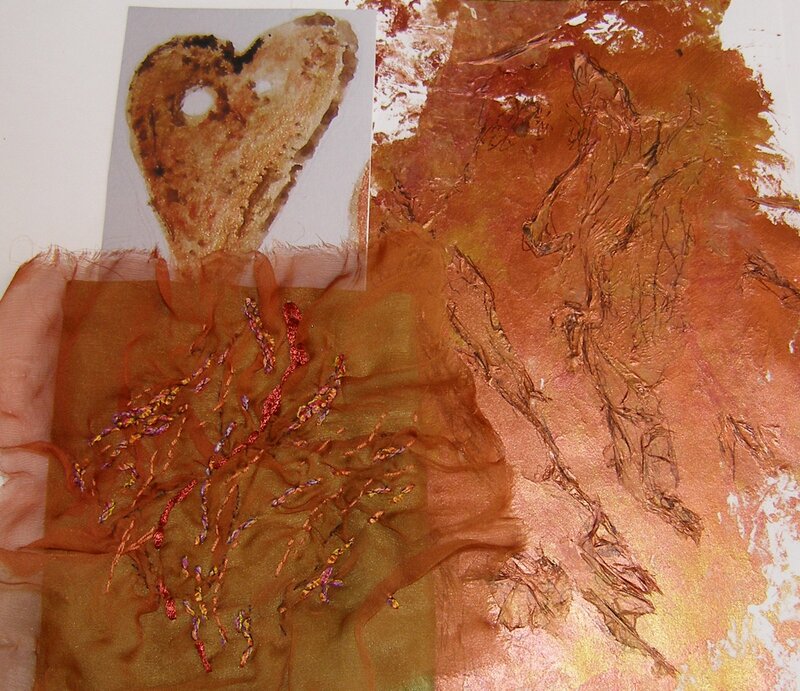 Can you begin to see the relationship between stitching and drawing? Absolutely yes! I managed to surprise myself in the last stage by thinking and planning the stitches I wanted to use and doing a quick drawing of these first as my previous working method has always been to jump straight into stitching without thinking it through. I am please to add this developmental stage to my process. Were you able to choose stitches which expressed the marks and lines of your drawings? Yes I think so. I do have a preference for certain stitches like chain stitch and Cretan stitch so I must remind myself not to get too fixated on these. I have also previously underrated running stitch as being too ordinary but found that I used this quite a bit in my sampling as it suited the marks better. As I expand my knowledge of stitches and practice I should become better at matching stitches to marks and lines. Did you choose the right source material to work from? In terms of the drawings as source material at this stage I have only a few drawings in my course workbooks and in my sketchbook. I am still building on my sketchbook work and this will give me a wider choice in the future. I was pleased with the source materials that I used as they gave me the opportunity to try a number of different techniques. Do you think your sample works well irrespective of the drawing? Or is your sample merely a good interpretation of your drawing? A mixture is the answer here – some of my samples were pure copies of the drawing but others had more freedom in their interpretation. I was particularly pleased with the sample I did in stage 3 based on the image of the copper button as this was a free interpretation of the textured surface rather than a direct copy. Also in stage 4 I think my first 3 samples were copies but the last two worked well independently. Which did you prefer – working with stitch to create textures or working with yarns to make textures? Which worked best for you and why? Working with stitch because it was then up to me to manipulate the yarn to produce the required effect instead of letting the yarn do all the work. I think it will very much depend on what effect I am trying to produce; there are some amazing yarns available but sometimes that can dominate and overpower a piece. Make some comments on individual techniques and sample pieces. Did you experiment enough? Did you feel inhibited in any way? Fix them into your sketchbook if you want to or start a separate book of sample references. I enjoyed working with French knots to create texture and found that I really liked the variation of this stitch from small, neat stitches, to looser knots that really stood out from the background fabric (see stage 4 picture above). 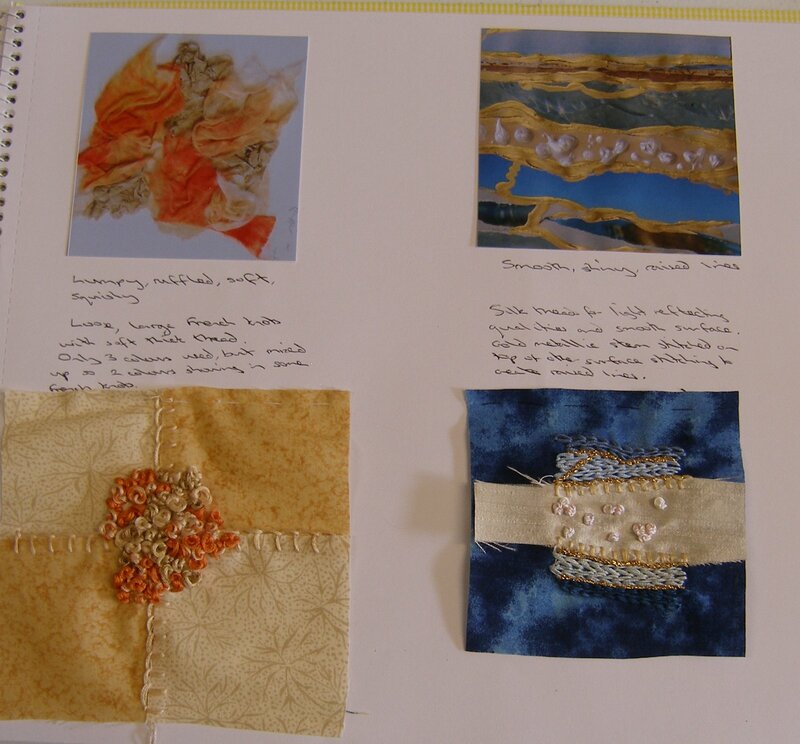 I also enjoyed the samples where I used a couple of background fabrics instead of just one, as in the copper piece in stage 3 and two of the samples in stage 4. Experimentation possibilities are almost endless, I did feel that some parts of the project were repeating earlier parts and there was a lot of overlap between stitch samples fitting in to different stages which confused the issue. I am not sure that it is ever possible to say that enough experimentation has been done because it is always possible to to more. I did not feel inhibited while doing these exercises but they were new to me so there is always room for improvement. 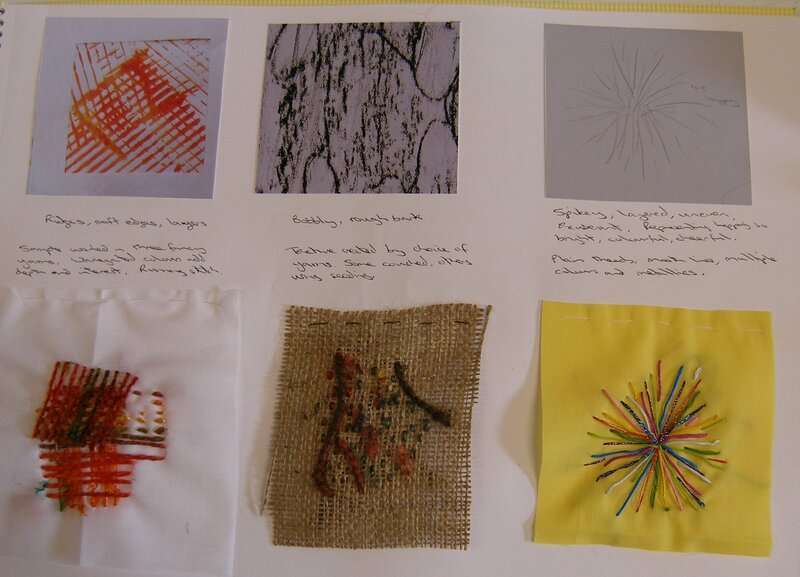 Do you prefer to work from a drawing or by playing with materials and yarns to create effects? Which method produced the most interesting work? I enjoy both ways of working. Playing with materials and yarns without following a defined plan is fun and I used this method when playing with the new Maggie Grey technique I tried during this project (not part of the defined coursework) as I selected my yarns and stitches as I went along, reviewing the piece at each stage to see what to add next. I like the freedom this method gives me. I am starting to enjoy working from a drawing though as it does give me more discipline and a series of steps to follow, this should result in more sampling and pieces of work matching my plans. Are there other techniques you would like to try? Are there any samples you would like to do in a different way? I concentrated on hand stitching for these samples and would like to expand my work to included machine stitching as well, particularly using soluble fabrics. I would also like to create more varied backgrounds to work into with stitch although I recognise the benefits of trying these early samples on plain backgrounds to concentrate on the stitching itself. I do not think I would repeat any of these sample but in a different way unless I had an end goal in mind. Is there anything you would like to change in your work? If so, make notes for future reference. I feel that I am at such an early stage with this that I will be changing and developing my work as the course progresses. I do need to practice more drawing and am working regularly in my sketchbook so this should improve over time. I am very literal in my drawing so it would probably help to relax more and make a mess!